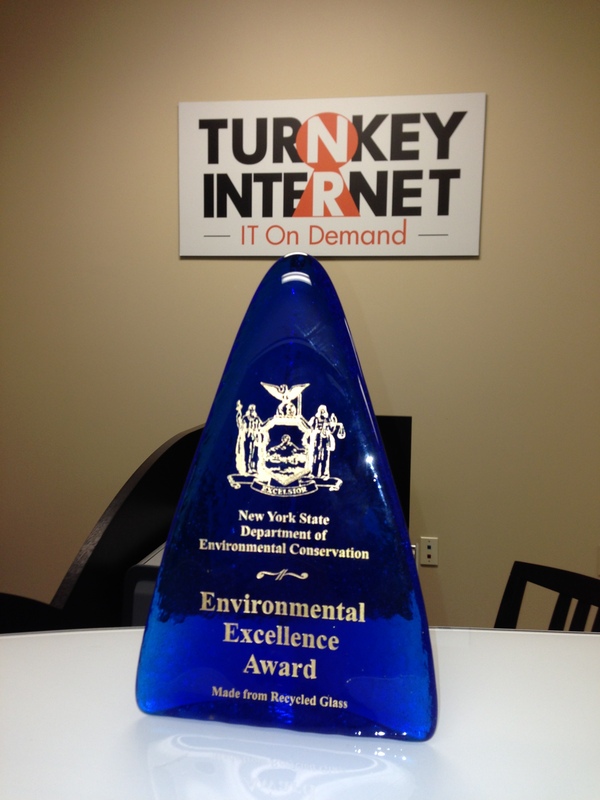 LATHAM, NEW YORK (December 11, 2013) – Sustainable IT solutions provider TurnKey Internet, Inc. announced that it has been awarded the 2013 Environmental Excellence Award by the New York State Department of Environmental Conservation for TurnKey’s work on transforming a vacant, former post office building into one of the nation’s leading high-tech, sustainable data centers. 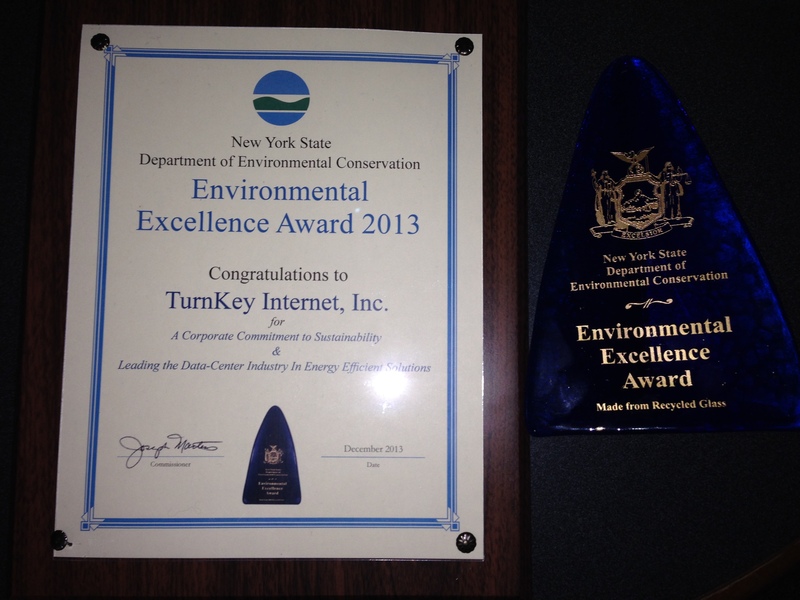 The award from the New York State Department of Environmental Conservation recognized TurnKey’s innovative facility design and outstanding commitment to environmental sustainability, social responsibility and economic viability. Turnkey’s innovative green data center sets a benchmark for the data center industry through use of ultra-efficient cooling, unified power systems and renewable energy sources that create a carbon neutral facility. TurnKey’s sustainable data center includes a roof-top solar array, backed by hydro-electric renewable power sources and cutting-edge cooling technologies that minimize energy consumption. TurnKey’s green data center is one of only two ENERGY STAR® certified data centers in New York and one of just 39 in the United States. In recognition of their commitment to the environment, TurnKey Internet has seen several prestigious titles and certifications this year including the United States Environmental Protection Agency (EPA) officially naming its Latham, New York facility an ENERGY STAR® certified data center. In April, the company announced their implementation of the New York State Governor’s ReCharge New York hydroelectric power system. This, combined with the solar power the facility generates on site, allowed them to achieve a zero carbon footprint. Additionally, they announced their SSAE 16 Type 2 security certification earlier in the year. 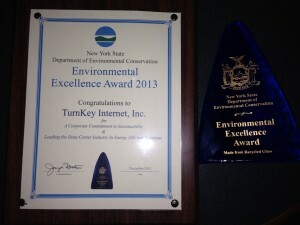 “We are honored by New York State’s recognition of our facility and our ongoing commitment to sustainability,” said Adam Wills, president and CEO of TurnKey Internet. “Data centers are massive power consumers, and the industry as a whole is expected to be larger polluters than the airline industry by 2020. TurnKey has created a zero carbon foot print facility and a working blue print for ultra-efficient data centers that we hope will be adopted by other facilities across the globe to help create a sustainable environment. Founded in 1999, TurnKey Internet, Inc. is a full-service green data center and leading provider of sustainable web hosting and IT solutions. From its SSAE 16 Type 2 and ENERGY STAR® certified facility in Latham, NY—New York’s Tech Valley Region—TurnKey offers web hosting, communication services, web-based IT systems, software as a service (SaaS), enterprise colocation services, and computing as a service to clients in more than 150 countries. For more information, please call (518) 618-0999 or visit www.turnkeyinternet.net/media. « Is your Web Site and Business ready for a Black Friday Rush?